Bramley Cottage01263 715779work01603 870304fax Self-cateringThis charming end-terrace late Victorian cottage sits on the outskirts of the village of Dersingham, facing the village church. It is very comfortable, well equipped and a perfect location with excellent access for coastal walks, Peddars Way, RSPB and Sandringham House. The local village pubs serve food and there is Thaxters Garden Centre and Coffee Shop, as well as a good selection of restaurants close by. No smoking at this property. 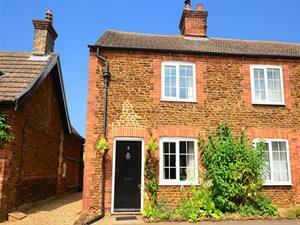 A traditional Norfolk cottage with a sunny aspect. This charming end-terrace late Victorian cottage sits on the outskirts of the village of Dersingham, facing the village church. It is very comfortable, well equipped and a perfect location with excellent access for coastal walks, Peddars Way, RSPB and Sandringham House. The local village pubs serve food and there is Thaxters Garden Centre and Coffee Shop, as well as a good selection of restaurants close by.